Animal glyph icon set, beast symbols collection, vector sketches, logo illustrations, farm signs solid pictograms package isolated on white background, eps 10. 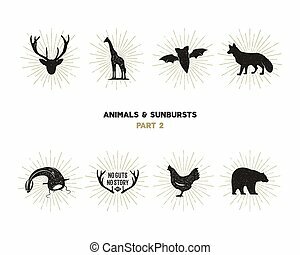 Set of wild animal figures and shapes with sunbursts isolated on white background. Black silhouettes giraffe, chicken, fox, deer, catfish and bat . Use as icons or in logo designs. Vector pictograms. Easter rabbit line icon, easter and holiday, bunny sign vector graphics, a linear pattern on a black background, eps 10.
minimal logo of chicken on black background vector illustration design. red color chicken face on white back ground vector illustration design. 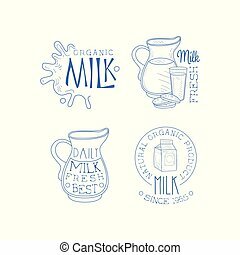 Set of 4 monochrome emblems for milk production business. Fresh and natural dairy product. Creative logo templates in sketch style. Design for promo poster. Vector icons isolated on white background. 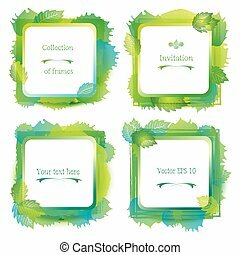 Set of 4 green frames - watercolor forest label collection, grunge paint with splashes and blotch. Vector spring borders. Design element collection. Nature, bio, ecology concept. Isolated on white. Eps 10. 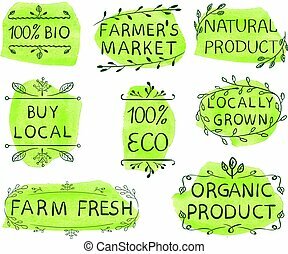 100 bio, eco, buy local, farmer's market, natural product, locally grown, farm fresh, organic product. Set of hand drawn VECTOR icons on dark green watercolor spots, green lines. 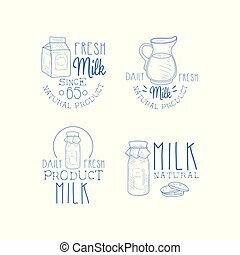 Collection of 4 hand drawn logo templates for milk production industry. Original monochrome emblems. Design for advertising poster or flyer of dairy products. Vector illustrations isolated on white. Farm glyph icon set, farming symbols collection, vector sketches, logo illustrations, agriculture signs solid pictograms package isolated on white background, eps 10. Animal line icon set, beast symbols collection, vector sketches, logo illustrations, farm signs linear pictograms package isolated on white background, eps 10. Animal thin line icon set, beast symbols collection, vector sketches, logo illustrations, farm signs linear pictograms package isolated on white background, eps 10. Logistic glyph icon set, Delivery symbols collection, vector sketches, logo illustrations, shipping signs solid pictograms package isolated on white background, eps 10. Prohibition glyph icon set, forbidden symbols collection, vector sketches, logo illustrations, ban signs solid pictograms package isolated on white background, eps 10. Kitchen glyph icon set, household symbols collection, vector sketches, logo illustrations, cooking signs solid pictograms package isolated on white background, eps 10. Office glyph icon set, business symbols collection, vector sketches, logo illustrations, work signs solid pictograms package isolated on white background, eps 10. Finance glyph icon set, banking symbols collection, vector sketches, logo illustrations, money signs solid pictograms package isolated on white background, eps 10. Medicine glyph icon set, hospital symbols collection, vector sketches, logo illustrations, anatomy signs solid pictograms package isolated on white background, eps 10. Bitcoin glyph icon set, cryptocurrency symbols collection, vector sketches, logo illustrations, finance signs solid pictograms package isolated on white background, eps 10. Sport glyph icon set, fitness symbols collection, vector sketches, logo illustrations, game signs solid pictograms package isolated on white background, eps 10. Halloween glyph icon set, spooky symbols collection, vector sketches, logo illustrations, horror signs solid pictograms package isolated on white background, eps 10. Halloween glyph icon set, scary symbols collection, horror holiday vector sketches, logo illustrations, party signs solid pictograms package isolated on white background, eps 10. Christmas glyph icon set, new year symbols collection, vector sketches, logo illustrations, holiday signs solid pictograms package isolated on white background, eps 10.